Overall impression: I'd rate this book a 3.5 / 5. It's an engaging read, recommended to those interested in Greek or Trojan mythology. That being said, there are countless interpretations of the Iliad, and it may be unfair to expect it to do something that hasn't been done before. It's not a retelling. It rarely strays from the original, but will be a good introduction to the myth. Summary: As a young boy, Patroclus is one of the princes present at the time when the beautiful Helen chooses to marry the red-haired Menelaus. Along with the other warrior men, Patroclus takes the oath, proposed by Odysseus, to honour Helen's choice and defend her husband against anyone who'd take her from him. All princes present are enviably handsome, powerful and gifted, while Patroclus is a little boy, feeble, unpromising and a disappointment to his father. 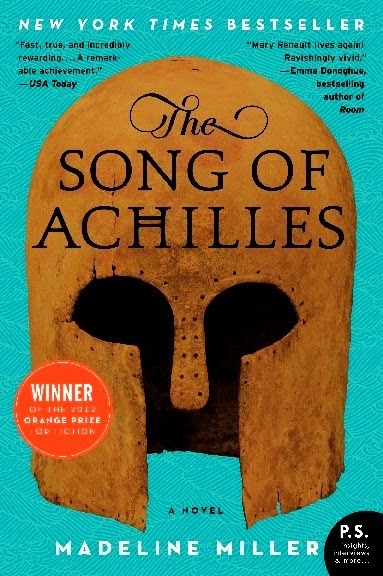 One day, at the age of eight, Patroclus accidentally kills a boy who bullies him, and confesses. His father, infuriated by his un-princely humbleness, exiles him to Pythia, a small country ruled by King Peleus. Peleus's son, sired from the sea-nymph goddess Thetis, is prophecized to be Aristos Achaion, the best of the Greeks. Achilles. Ignoring all the boys who fight for his attention, Achilles chooses Patroclus as his companion. Their friendship blossoms into love. Even Achilles's mother finds Patroclus unworthy of her son, and they struggle against all odds to be together. During their apprenticeship with Chiron, king of the Centaurs, news arrives of Queen Helen's abduction from Sparta and Agamemnon's appeal to sail to Troy to rescue her. Achilles, unable to trick his fate, and Patroclus, bound by his vow, are recruited to join the Greeks. With the prophecy hanging over their heads, certain that Achilles would die in the war, after the death of Hector, the Myrmidons, commanded by Achilles, set off for Troy. What I didn't like: Flitting tenses are annoying, but that's just me. Patroclus's narration is often maudlin and he seems infatuated with Achilles and absurdly unaware of his own potential, until the moment it's revealed to us (surprise!) that Patroclus is the best of the Myrmidons. Patroclus's descriptions of Achilles are garish and repetitive, and the love scenes are sometimes laughably awkward. At some of the key moments, the purple prose strives to invoke a reaction and we lose the profound simplicity such scenes demand. What I liked: The Song of Achilles is aptly titled and looks at Achilles in all his glory and terror with an unbiased honesty, that only a lover can show. The story and the point of view turns the hero or the villain, as he's bound to be either extreme in most interpretations of the myth, into a person. The characters of this book are charmingly fleshed out, my favourites are Odysseus, Thetis and Briseis. The floweriness of Patroclus's descriptions doesn't extend to the dialogue, which has a good flow and gives each character his distinct voice. The all encompassing quality of this book makes it special. It strings together countless stories of all the men of Greece and Ilium and all the Olympian gods, capturing the essence of an epic. It's clear that a lot of research went into this book, and that makes the absence of information dumps all the better. "Name one hero who was happy." I considered. Heracles went mad and killed his family; Theseus lost his bride and father; Jason's children and new wife were murdered by his old; Bellerophon killed the Chimera but was crippled by the fall from Pegasus' back. "You can't." He was sitting up now, leaning forward. "Tell me." I loved it when he was like this. "I'm going to be the first." Chiron had said once that nations were the most foolish of mortal inventions. "No man is worth more than another, wherever he is from." "But what if he is your friend?" Achilles had asked him, feet kicked up on the wall of the rose-quartz cave. "Or your brother? Should you treat him the same as a stranger?" "You ask a question that philosophers argue over," Chiron had said. "He is worth more to you, perhaps. But the stranger is someone else’s friend and brother. So which life is more important?" We had been silent. We were fourteen, and these things were too hard for us. Now that we are twenty-seven, they still feel too hard. Odysseus shrugs. "We cannot say. We are men only, a brief flare of the torch. Those to come may raise us or lower us as they please." This sounds good. In spite of its flaws I want to read it because I love Greek mythology (I skipped the spoiler part of your review, thanks for the warning), though what I remember is just bits and pieces.